Today we continue our Stewardship emphasis. 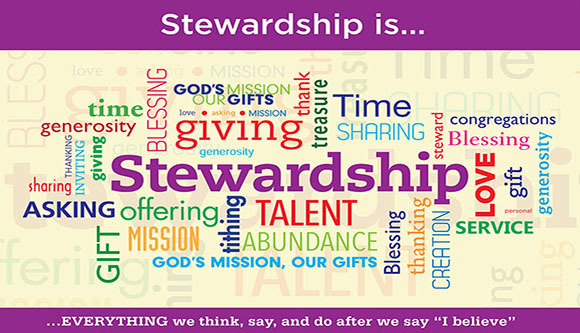 One of the things that stewardship is about is how we use the gifts and talents that God has given us. Last week, as Worth preached on stewardship, I learned that one of his talents (which he had kept hidden from me- and likely from the rest of you) is that he can rap- “we have to name it before we can claim it, confess it before we possess it, believe it before we receive it.” I was impressed! While that is definitely one of Worth’s previously hidden talents, it is most definitely not one of mine. So there won’t be any rapping in today’s message. Last week, Worth talked about the powerful “P’s” of Philippians: Praise, Prescription, Personal Example. Paul praised the Philippians and Worth praised this congregation. And from all that I have seen and heard and know, that praise is justified in both situations. Paul and Worth both prescribed joy and confidence. Joy of attitude and life and spirit as followers of Christ; confidence that we can take our fears and our anxieties to God and receive God’s peace. And the final powerful “P” was personal example. And again both Paul and Worth offer excellent examples of what it means to be a Christian. When you follow their example, you jump in with both feet and give your very all. One of the other things that Worth mentioned in his sermon was that if he were a “young minister with a choice, somebody like Joe Moore” that he would rather serve here than almost anywhere else. While I might have to dispute the first part of that statement because I don’t really know if I can be considered a “young minister” anymore (though I’ve not been doing this for as long as Worth has, I have been doing it for almost 2 decades and have at least 2 decades to go) I can’t argue with the second part. I would most definitely rather be here than anywhere else. In the little over one year that I have been your Associate Pastor, I have seen so many things that bring me joy about who we are and what we are doing. I have seen many things that get me excited about who we can be and what we can do in the future. I truly believe that New Philadelphia Moravian Church is THE place to be; because of both who we are and what we do. There is an interesting dynamic at work here in the relationship between who we are and what we do, not just here at New Philadelphia but in all aspects of our life and faith. And I think it bears closer examination. Let’s start with who we are. Certainly if you were to ask me the question “Who are you?” I could give you the facts and figures about who I am- where I was born, who my family is, where I grew up, went to school, church, where I work, what my hobbies and interests are, etc. I know that all of you could do the same and easily rattle off the facts and figures of your lives. But that doesn’t really answer the question because that is not really who we are. We share the basic biographical information as our default answer to the question “Who are you?” because we don’t want to share the real answer- we don’t want to share what it is that makes us, us. We don’t want to share what we consider our gifts and strengths because that would seem like boasting and bragging. And we don’t want to share our faults and shortcomings because who wants to talk about what we can’t do. We would rather keep those things hidden. Just as we would rather have others notice our gifts and strengths than have to tell about them ourselves. Of course, we aren’t likely to answer that question in that way. We aren’t likely to go around saying “I am God’s beloved child.” But we should. Because most often, when someone asks us who we are, they really want to know who we are- not where we were born, or went to school, or where we work or anything like that. And they certainly don’t mean it as a trick question, they aren’t trying to trip us up or trap us. Their intent in asking is genuine. And most unlike the Pharisees and Herodians when they question Jesus. They don’t really want to know what he thinks about paying taxes to the Emperor. They want to trap him and trick him into making a response that will get him in trouble. The Herodians and Pharisees were not usually allies. The Herodians were Jews who worked closely with the Romans who occupied Israel, viewed by many as traitors to their own people and faith. The Pharisees were those who were concerned with strict adherence to the Torah, to the law of God rather than the law of man. About the only thing that would cause these two opposing groups to unite would be to fight a common enemy. They found one in Jesus. The Herodians opposed Jesus because they saw him as a threat to their relationship with the Romans. Anyone who claimed to be the Messiah was a threat. The Messiah was the one who was supposed to come and lead the Jews to victory over their oppressors. And the Herodians had certainly heard rumors that people were saying that the man from Nazareth just might be the long awaited Messiah. The Pharisees opposed Jesus because he was a threat to their religious authority. During Jesus’ time, the Pharisees were the ones that all the people looked to to help them interpret and understand and follow the Law of God. Their strict interpretation was respected and listened to. The Pharisees were the ones who defined things like what constituted work on the Sabbath. So when Jesus came along and said things like “The Sabbath was made for man not man for the Sabbath.” the Pharisees saw him as a threat the their teaching and authority. The Herodians and Pharisees joined together to try to trap Jesus in his own words. The question that they posed to him should have been the perfect trap. “Tell us then,” they ask, “what you think. Is it lawful to pay taxes to the Emperor, or not?” There is really no way that Jesus can safely answer that question. If he says that it is lawful to pay taxes the Emperor, then the Pharisees can accuse him of being a traitor to his people and faith. But if he says it is not lawful, then the Herodians can accuse him of crimes against the Roman Empire. Of course, Jesus is able to get out of their trap. Rather than giving them an answer, he asks them a question. After asking them for a coin that is used to pay the tax in question, and seeing the image of the Emperor on it, Jesus asks them “Whose head is this, and whose title?” Upon hearing their answer that it is the Emperor’s image on the coin, Jesus says to them, “Give therefore to the Emperor the things that are the Emperor’s and to God the things that are God’s.” And that response basically shuts up both the Pharisees and Herodians. Rather than asking who are we, we should be asking whose image we bear, or in whose image are we made. And the answer comes from the very beginning. “Then God said, “Let us make humankind in our image, according to our likeness;” Whose image do we bear? We bear the image of God, we are made in God’s likeness. We are God’s beloved children, we are chosen by God. That is who we are. And we do what we do because we are who we are. I think this is absolutely essential to remember as we consider our stewardship. In Jesus’ response to the Pharisees and Herodians to “…give to God the things that are God’s…” if we can allow ourselves to hear this as a call to stewardship, then we can begin to see stewardship in a whole new light. If we hear this and remember that we are God’s- that we are created in God’s image and are chosen and beloved, then we give all that we have and all that we are to God. And all that we do is done for God. Our stewardship, rather than being something we focus on for a few weeks in the fall, becomes our constant and continual response to God. We give to God the things that are God’s. We are God’s- we bear God’s image, we belong to God and are chosen by God. When we see it like this, then our stewardship becomes the continual act of giving ourselves to God. Our stewardship becomes our constant giving of all that we do to God. That’s a tall order. It is a challenge to see everything that we are and everything that we do as stewardship. It is much easier to just keep on seeing stewardship as those few weeks in the fall when we think and talk about money. But that time has past. It is time to stop seeing who we are and what we do as two separate things. We need to start doing what we do because of who we are. We need to start seeing ourselves and defining ourselves as God sees us and defines us. And then giving to God the things that belong to God. When we do, then New Philadelphia Moravian Church will continue to be the place to be. It will continue to be the place where the message of the Gospel is our way of life. New Philadelphia Moravian Church will be the place where the hungry are fed and the thirsty are given drink, where the stranger is welcomed and the naked are clothed, where the sick are cared for and the prisoners are visited. New Philadelphia Moravian Church will continue to be the place where faith abides, where hope thrives and where love is unconditional. I completely and thoroughly believe that NPMC is this place where the Gospel comes to life. But it didn’t just happen overnight. It has taken years and years and years of faithfulness and commitment and service. And it will take renewed faithfulness, renewed commitment, and renewed service for our congregation to continue to be the place that it is, to continue to be the place to be. So as you consider your stewardship to God and to this congregation, consider risking yourself for God. Consider giving more than you think you can give, consider doing more than you think you can do, consider being more than you think that you are. And then be who God created you to be. And then do what God calls you to do. And then give to God the things that are God’s.